Rabbit anti Human EEF1A2 antibody recognizes elongation factor 1-alpha 2, also known as elongation factor 1-alpha 2, eukaryotic elongation factor 1 A-2, statin-S1, STN, or HS1. The EEF1A2 gene encodes an isoform of the alpha subunit of the elongation factor-1 complex, which is responsible for the enzymatic delivery of aminoacyl tRNAs to the ribosome. This isoform (alpha 2) is expressed in brain, heart and skeletal muscle, and the other isoform (alpha 1) is expressed in brain, placenta, lung, liver, kidney, and pancreas. EEF1A2 may be critical in the development of ovarian cancer. Alternatively spliced transcript variants encoding different isoforms have been found for EEF1A2 (provided by RefSeq, Oct 2008). 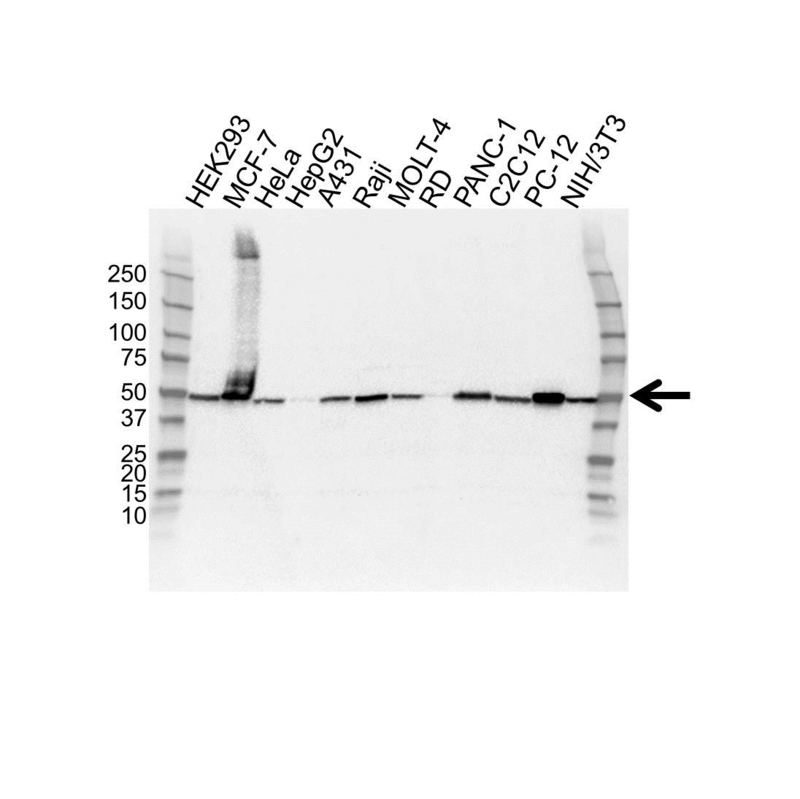 Rabbit anti Human EEF1A2 antibody detects a band of 50 kDa. The antibody has been extensively validated for western blotting using whole cell lysates.